Bitcoin responded with resilience following the recent Bitfinex hack, finding strength around the $580 level. After a short period of churning, a run past $600 seemed to indicate that buying appetite was still high. Unfortunately for bulls, the run stalled out quickly, and bitcoin finds itself at a perilous junction. The $600 level is a critical hold for short-term advancement, any weakness that breaks that level indicates a return to the previous support levels of $540 to $550. Short-term traders are encouraged to show restraint at the current price point of $608. Previous RSI trading patterns, above 65 and below 35, are not currently reliable. RSI breaches of 70 can still be confidently used to establish a short position, but these opportunities have been few and far between. 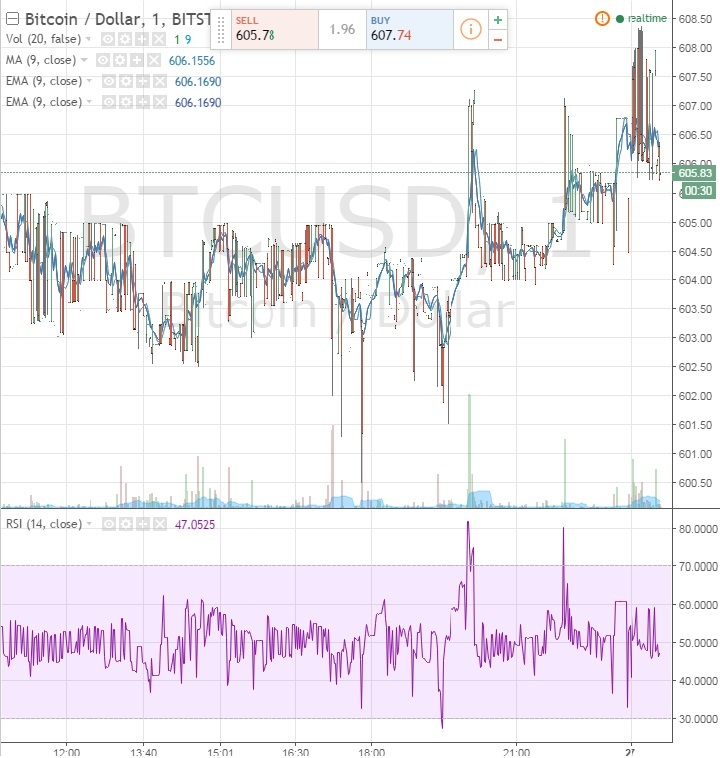 An RSI over 70 has been reached twice in the past 12 hours, as shown on the TradingView chart below. Both breaches were followed immediately by a pullback. A short position can be entered at an RSI of 70, and should then be exited at an RSI of 60. Inversely, even fewer long opportunities are available. An RSI of 30 was broken only once, and the following bounce was incredibly fleeting. Currently, short-term long trades should be viewed as very risky. Should bitcoin break below $600, support at the $540 level should be strong enough for a significant bounce. It was here that support stiffened most recently when tested. A downward move should be viewed as a boon for long-term holders, who can look to pick up cheap coins. Long-term outlook remains strong, as bitcoin continues to enjoy positive news and outlooks in 2016. Price upgrades and the continued strength of the US stock market indicate there is significant buying power still available to bolster bitcoin price. Day and swing trade opportunities are currently at a dangerous level of instability. Short-term traders should look to take the short opportunities available when an RSI glut over 70 occurs, but should otherwise avoid entering positions until a significant move in either direction occurs.